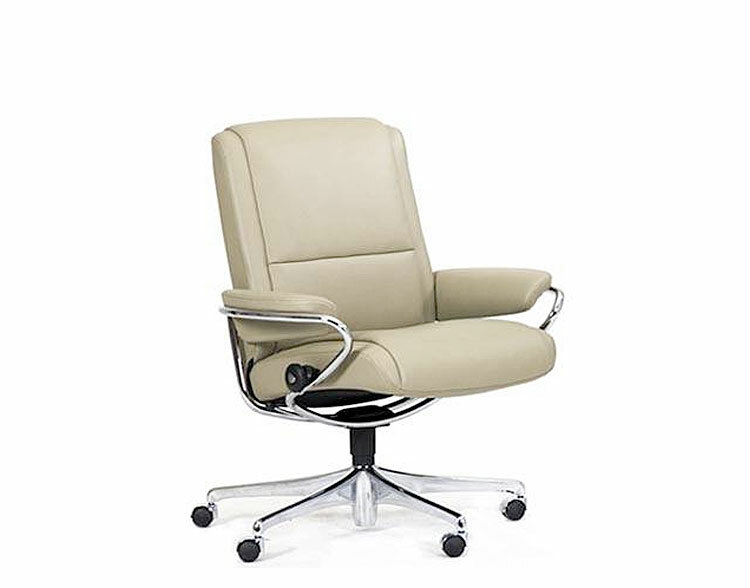 The Stressless Consul Office chair is built to provide an enhanced feeling of personal comfort while you work. It glides back smoothly – adding perfect support in any position. Even when working at home, comfort has been the main approach while developing the Stressless Office chairs. You will instantly recognize the comfort you feel as you sit and work. It’s the way it glides back smoothly – adding perfect support in any position. The Stressless Consul Office chair is built with perforated foam molded directly over the frame. The indentations in the Comfort-Zones™ technology allows your body to sink deeper into the seat, giving you an enhanced feeling of personal comfort. An additional pad of soft space-age foam ensures optimum comfort. Inspired engineering, trend forecasting and industry experience are the secret to creating luxurious furniture people are proud to own. As the “Innovators of Comfort,” Stressless is master of the comfort needs of the human body and continues to develop the most intuitive and beautiful comfort technology. Stressless earned this title through 80 years of industry experience – from developing classic pieces to trend forecasting to find the next beautiful design, they truly grasp what makes furniture part of a lifestyle.